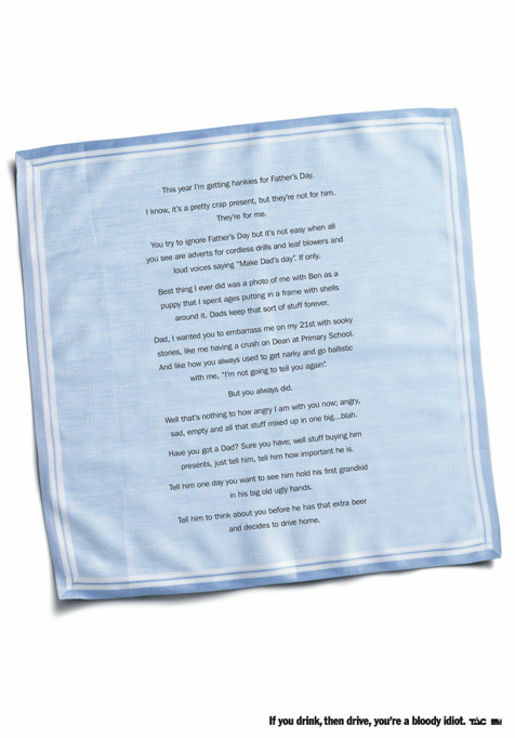 This year I’m getting hankies for Father’s Day. I know, it’s a pretty crap present, but they’re not for him. They’re for me. You try to ignore Father’s Day but it’s not easy when all you see are adverts for cordless drills and leaf blowers and loud voices saying “Make Dad’s day”. If only. around it. Dads keep that sort of stuff forever. Dad, I wanted you to embarrass me on my 21st with sooky stories, like me having a crush on Dean at Primary School. And like how you always used to get narky and go ballistic with me, “I’m not going to tell you again”. But you always did. Well that’s nothing to how angry I am with you now; angry, sad, empty and all that stuff mixed up in one big… blah. Have you got a Dad? Sure you have; well stuff buying him presents, just tell him, tell him how important he is. Tell him one day you want to see him hold his first grandkid in his big old ugly hands. Tell him to think about you before he has that extra beer and decides to drive home. The Father’s Day campaign was developed at Grey, Melbourne, by art director Pete Becker, copywriter Nigel Dawson, associate art director Amahl Weeratne, agency producer Grace Deacon, photographer Stuart Crossett, sound and music produced at Risk Sound, Melbourne by Nigel Dawson and Phil Webster.